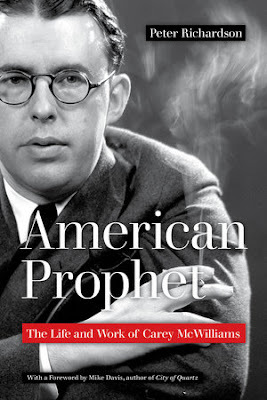 The University of California Press has published a paperback edition of my Carey McWilliams biography--this time with a fabulous foreword by Mike Davis. An advance copy of American Prophet appeared in my mailbox last week. The official publication date is March 5, but you can buy it here now. My respect for McWilliams hasn't diminished a bit since I began the research more than 15 years ago. His brains, range, versatility, and classic prose style still floor me. And as I research Hunter Thompson's literary formation, McWilliams once again looms large. It was McWilliams, of course, who gave Thompson the idea for his story on the Hells Angels. After McWilliams ran it in The Nation, Thompson parlayed it into his first bestseller. The good folks at Truthdig ran a Q&A on McWilliams and my longstanding interest in his achievement--often in the face of fierce resistance from formidable adversaries.